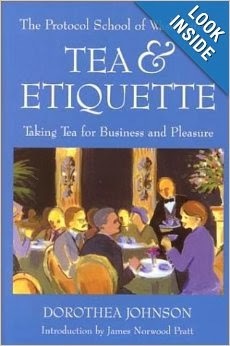 For fun and pleasure I purchased a copy of Tea & Etiquette : Taking Tea for Business and Pleasure, by Dorothea Johnson. I mentioned a few weeks ago that my new passion in life seems to be tea. 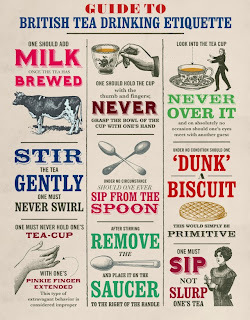 I am greatly enjoying learning more about tea itself and the taking of it. I'm curiously looking into a variety of books on the subject but I figured I ought to start with learning how to politely approach it. For it would see that tea is something to be approached - and ever so carefully at that. I had no idea who on earth Dorothea Johnson was before I picked out this book but, as it turns out, she's well known for teaching others proper behavior for tea and for use in society at large. Chiefly, she is known as the Founder of The Protocol School of Washington and she is also known as the grandmother of actress Liv Tyler. If you don't feel too intimidated by this (and even if you do) this book makes for a quick and easy read. I'm glad I started with it, so far as social manners are concerned. Americans, as we all know, are big on independence and individuality. We like words like "rogue" and "freedom" and the almighty "I." Somehow we have interpreted words and defined ourselves into a box in which anything goes and usually does. As a result of our self-centerdness, we think very little of others. We are a remarkably selfish and unkind lot. We demand that people cater to us and surround ourselves with gadgets that do, just in case the real world starts to become too demanding. Certainly learning to chew with one's mouth closed and keep elbows off the table seems so old-fashioned as to be irrelevant. (Seriously. Why can't people generally chew with their mouth closed?) But the truth of the matter is, manners count because by practicing them you usually find that you are "doing unto others as you would have them do unto you." We all like it when people speak quietly and politely in addressing us. We like it when we are speaking to them without being distracted by their lack of manners and smart phones. The idea of being in possesion of a good set of manners should neither terrify us or cause us to think of only the snobbiest of people (for if you have good manners you aren't snobby at all). Instead of fearing manners, I propose we ought to relish the idea of extending common courtesies to others knowing that we like courtesies extended to us. 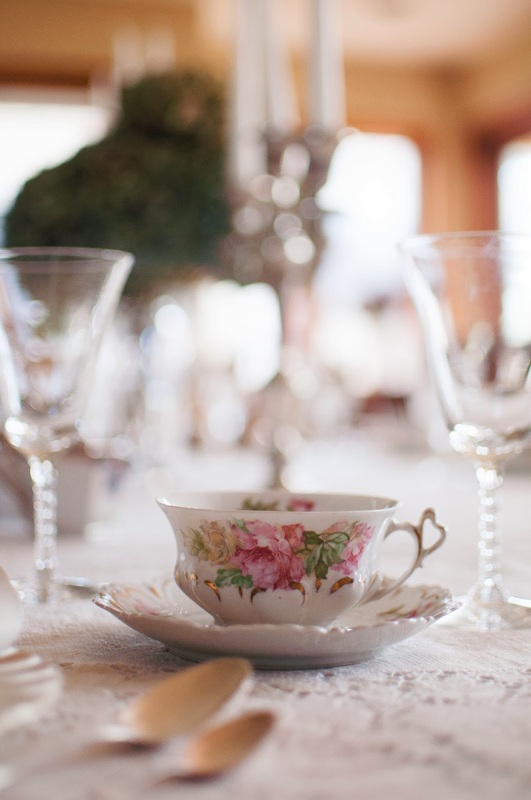 Now, Tea & Etiquette focuses rather exclusively on etiquette while taking tea. In this book I learned shocking things about how rude it is to repeatedly and rapidly dunk one's tea bag into the cup in order to speed up the process. (Tea is not meant to be rushed.) I also learned that sticking one's pinky in the air while drinking is a huge no-no, as is looking over your cup while you are drinking instead of into it. (I feel sloppy indeed.) 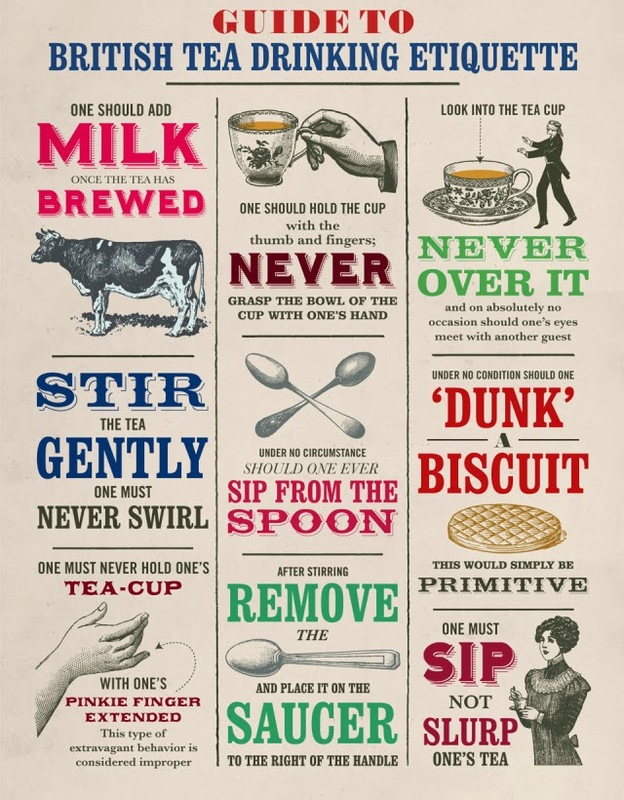 I've been positively crude in my tea usage but no more! Heh. I'm learning to do better. I let my tea seep at its own pace now but I cannot deny that I stare at it wondering how long its going to take to reach the level of strength that I normally like for my tea to be! Cream Tea - A light tea involving some scones, jam, clotted cream and choice of tea. 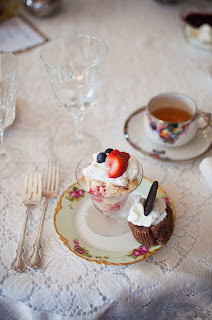 Light Tea - A lighter version of afternoon tea, and includes cones, sweets and choice of tea. 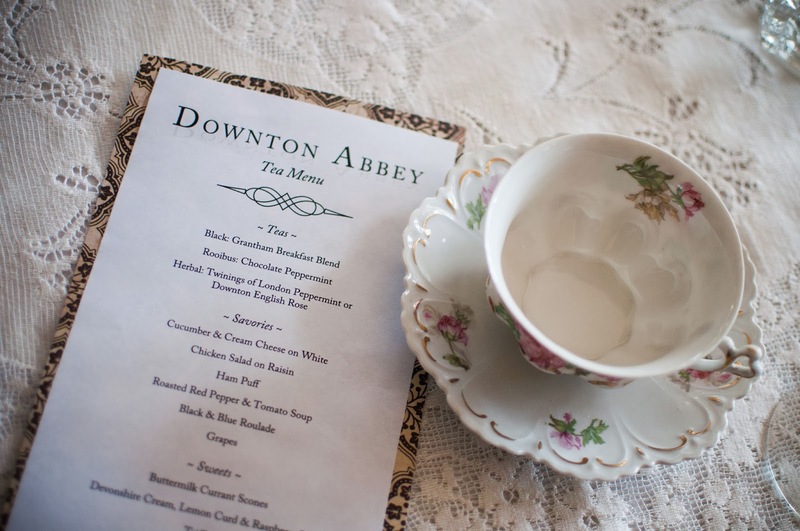 Royal Tea- Includes choice of tea, a four-course menu and a glass of champagne or sherry. The addition of the champagne or sherry gives this tea its distinction. 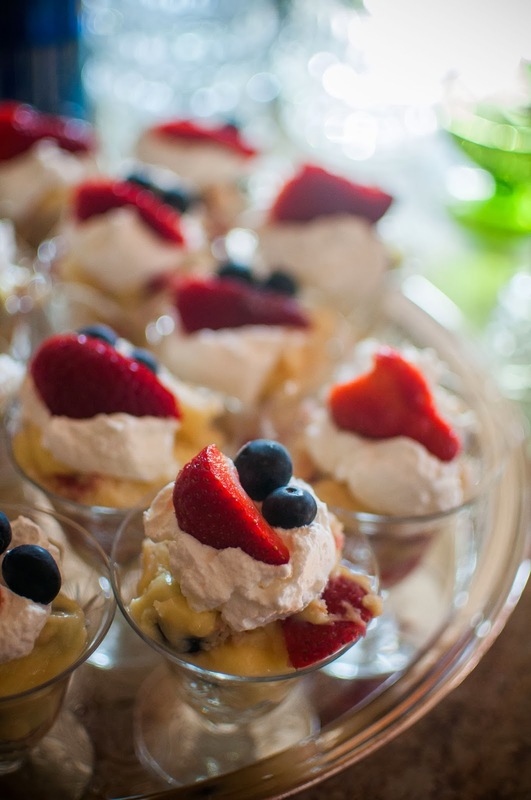 High Tea - ". 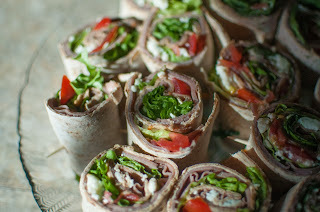 . . NOT finger sandwiches, scones, and sweets. That, of course, is tea or afternoon tea." 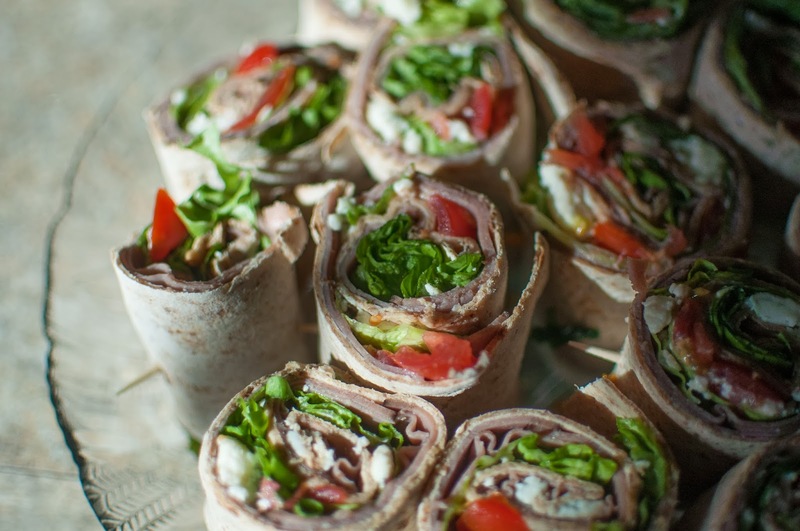 High tea is a "hearty, simple, sit-down meal" that was generally the main meal of the day for workers returning from fields or shops. 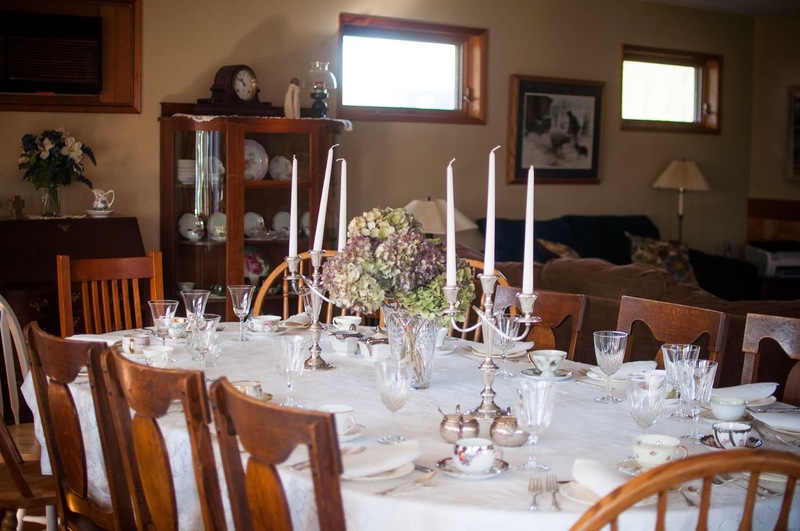 The meal is served family style and includes heavier dishes like meat pies, sausages and cold meat, etc. This friend of mine who got me hooked on the idea of throwing tea parties coordinated with me and we recently threw a Downtown Abbey tea for a few of our friends. (Unfortunately I had not read this book before the tea or else I would have known that you do not drink tea while wearing gloves!) Regardless of whether or not we were following proper rules we had a really fun time dressing up and enjoying some yummy treats and excellent company. I think that is what counts the most, in the end. No one (that I'm aware of) was offended by the manners (or lack thereof) of any particular guest. 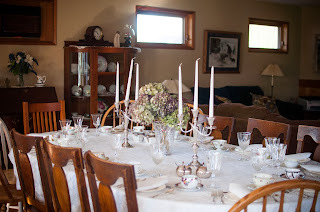 Here are some photos from our Full Tea. We really did have a marvelous time and are looking forward to many more teas in the future. 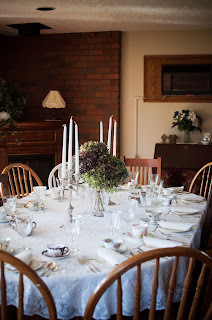 (There are a few of you blog readers out there that I would simply love to gather with and have tea! A dream and a wish!) In the meantime, I am enjoying more about the tea process and what is involved in throwing a proper tea. It's a fun mental challenge! Are there any books about tea that any of you would suggest for me to read? I'd be curious to hear of them if you are willing to share! 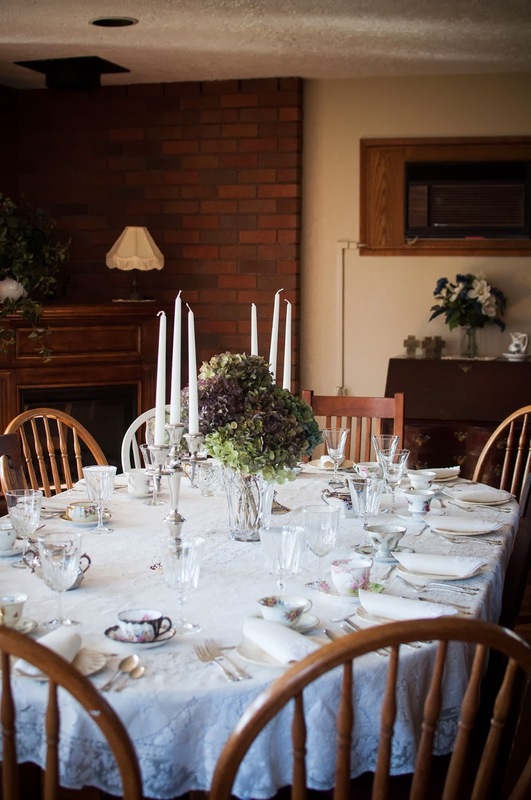 I love that you host tea parties! I too would love to come and chat with you over tea! Your tea parties are beautiful, though!